Whether you are buying a new bike, switching between bikes, or simply installing a new saddle, bike fit is very important. It's not just about setting your seat height, however. To keep your road bike position the same, every time, every ride, there are three measurements that you should be aware of—and checking constantly, i.e., saddle height, saddle set back and handle bar reach. 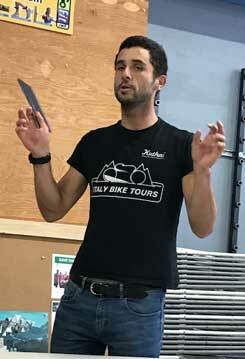 We learned all about this and more when Mike Helin of Sports Basement talked about bike fitting at our October 7th team meeting. Mike was followed by new member Gary Montrezza who will introduce Italy Bike Tours (IBT) and Passoni Titanium Bicycles to our membership.